Many people will get tight calf muscles. Some people notice when they get tight calf muscles and others don’t. Regardless, tight calf muscles can have a detrimental effect on your feet and your overall walking and activity function. The calf muscle region is made up of a muscle group called triceps surae. 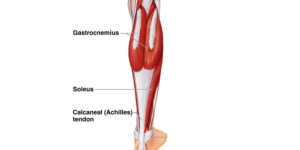 This muscle group includes; the large gastroncneimus muscles with their medial and lateral heads and soleus, a smaller but important muscle that has a vital role in gait function. These muscles join to become the Achilles tendon attachment and have their insertion point in the large heel bone (otherwise known as Calcaneus). It is this muscle group that takes a great load during both standing, walking and more vigourous activities. During these activities the role of these muscles is to plantar flex the ankle joint, by that we mean push down the ankle joint as we move into the propulsion stage of gait. If these muscles remain consistently tight then the action and timing of this movement of ankle joint plantarflexion is disturbed. It can cause a change in your natural movement pattern and reduced the ability of your foot to dorsiflex (or pull your foot up) which reduces shock-absorption qualities of your feet and lower leg. This in turn can lead to overload injuries such as plantar fasciitis, Achilles tendonitis, MTSS or shin splints, as well as forefoot issues such as metatarsalgia. All of these issues can be avoided with regular maintenance and good elasticity of your calf muscles. Activities such as stretching, using foam rollers, massage and potentially heel lifts are all viable options to maintain good calf muscle elasticity and help reduce the chance of calf muscle tightness and development of overload injuries. If you have any concerns about the tightness of your calf muscles or want to avoid overload injuries that are caused by tight calves you can book an appointment with our experienced podiatrists at Podiatry HQ for an assessment and treatment plan.